Announcement Celebrate It! 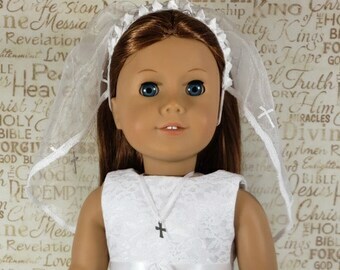 Celebrate her first communion with her doll. 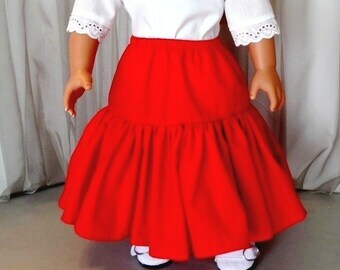 Jessica's Doll Closet has several showstopper first communion outfits; doll dress, veil, shoes and socks, etc. 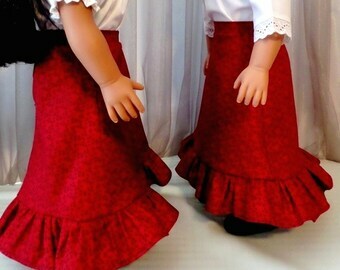 Our beautiful first communion doll outfits are a perfect gift for her to remember her first vows and a special keepsake she will want to save. Click on the Communion - Confirmation Section to view our selection. 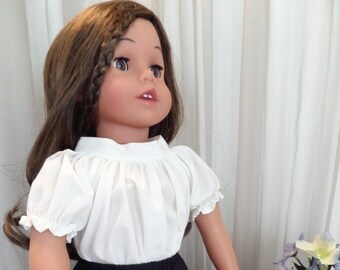 Doll clothes from Jessica's Doll Closet are made with high-quality craftsmanship, premium fabrics and trims. Items are sewn with a standard sewing machine and a serger sewing machine for durability in a pet and smoke free environment. Join Jessica's Doll Closet on Facebook for coupon codes, giveaways, sales. 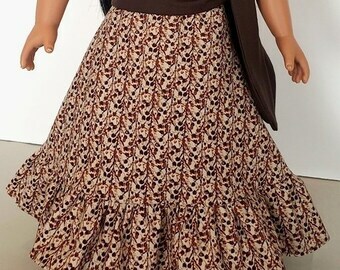 Be amongst the first to hear about new items fromJessica's Doll Closet. Celebrate It! Celebrate her first communion with her doll. Jessica's Doll Closet has several showstopper first communion outfits; doll dress, veil, shoes and socks, etc. 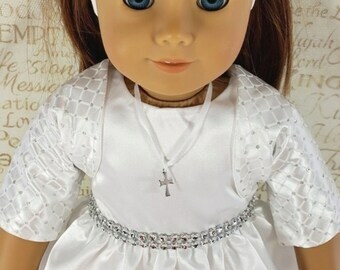 Our beautiful first communion doll outfits are a perfect gift for her to remember her first vows and a special keepsake she will want to save. Click on the Communion - Confirmation Section to view our selection. Adorable! Helps make the outfit. Looks great! Shipping was fast and seller’s communication was extremely helpful. Gives good fullness to a long skirt. Thanks! First Communion or Confirmation doll dress and veil. Visit our Communion/Confirmation Section for more styles. 1840 - 1880s Designer Brown Pioneer Doll Dress and Ivory Lace Apron. Ribbon belt included. Blue Tonal Sleeveless Dress with attached White Eyelet Apron with navy grosgrain ribbon. A darling matching floppy hat. 1940s Wisteria Floral Drindl Skirt with White Peter Pan Blouse and White Mary Jane Strap Shoes and White Ankle Socks. 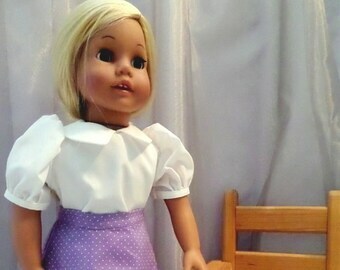 Jessica’s Doll Closet offers handmade doll clothes and doll accessories for 18 inch soft-bodied dolls, such as American Girl, Madame Alexander, Springfield Collection, Our Generation and many more. Our doll collectors and other buyers have chosen from our doll undergarments to our elegant doll fashions that represents the historical 1770s -1890s Victorian Era, Edwardian Era, Pioneer Era, Civil War Era, and the Vintage Era of the 1920s - 1970s through modern day doll clothing including doll shoes and socks. 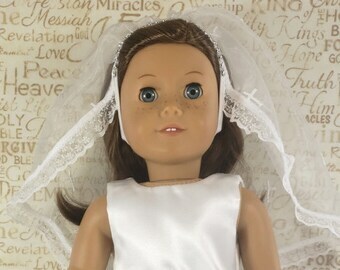 Jessica’s Doll Closet also proudly offers a wide selection of 18” doll First Communion Doll Dresses and Veils. Join Jessica's Doll Closet on Facebook for coupon codes, giveaways, sales. 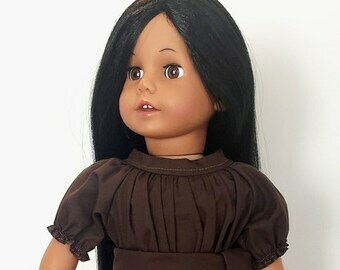 Be amongst the first to hear about new items from Jessica's Doll Closet. Jessica's Doll Closet is a one-person operation, Me. I have lived most of my life in Rochester Hills, Michigan. Mother/Step Mother of 5, Grandma to 11. A retired Executive Secretary who now enjoys the good things of life. Welcome! 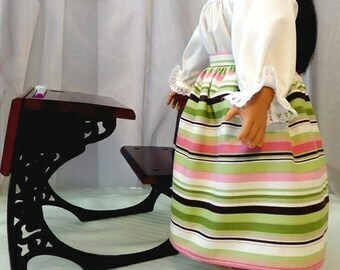 I hope you enjoy browsing my handmade doll clothes and doll accessories. 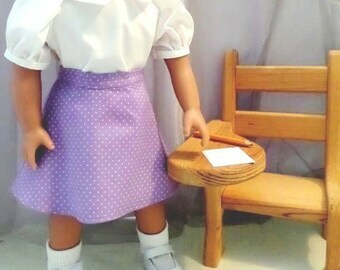 Through my creations I envision the wants and needs of a young girl or a doll collector, hoping to fulfill their desires. Return item(s) within (7) days of delivery. Returned item must be in new and un-played condition. There is no reimbursement for original or return shipping charges. The following item can not be returned or exchanged; custom orders, personalized items or items on sale. All custom orders, reserved listings, and special requests are final sale and cannot be returned or exchanged. All custom orders require full non-refundable payment at the time custom order is listed for payment. International orders, buyers are responsible for any customs and import taxes that may apply. I am not responsible for delays due to customs. 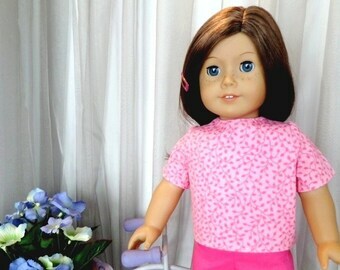 Jessica's Doll Closet accepts payments through Paypal or Debit or Credit Card. Debt/Credit cards are processed through a banking service of Etsy. I will not see or have access to your card information. If you do not have a Paypal account it is really easy and only takes a few minutes to setup. Allows you to make payments with your checking, debit card, credit card. Go to www.paypal.com to setup. Domestic (USA) orders will be mailed USPS First Class after payment confirmation from Etsy. Australia Orders - Effective 7/1/2018 orders will be charged a 10% GST Sales Tax. First Class Mail International, deliveries generally take between 7–21 days to arrive, although the USPS does not guarantee delivery dates or times. Mail may travel to its destination by ground, air or a combination of both. For Items shipped outside of the United States please be aware that your country may impose a VAT (Value Added Tax) on your purchase. You are wholly responsible for any and all VAT import duties or taxes added to your purchase and due to your government. Priority Mail International is required for the following locations: Asia, Africa and South America. I you live in these countries, please contact me before ordering. Priority Mail cost more than First Class Mail, I will have to adjust your shipping cost on the item(s) you want before you can make your purchase. All of the items in shop are personally sewn and cared for by me. I enjoy making custom orders for my customers, send me a convo message and we will work on it together.